I'm not generally a fan of second labels, but there has always been an odd exception in Anderson Valley: I like Migration Pinot Noir better than the main label, Goldeneye. Now I will no longer have the anguished "What's wrong with me?" feeling of wondering why I prefer the $34 mixed-breed duckling to the $75 single-vineyard lead drake. Migration is becoming its own winery. I can only hope it keeps its focus. The background is interesting. Both were started by Dan Duckhorn, an underappreciated wine visionary. In the 1970s, when Chenin Blanc was still big and red wine planters were mostly betting on Cabernet, Duckhorn foresaw the Merlot boom. For my taste, even though he sold the winery in 2007 to a private equity group, Duckhorn still makes some of the best Merlot in California. Then, in 1990, when almost nobody was making Pinot Noir here, Duckhorn started Goldeneye in Anderson Valley. Here's how long wine companies need to plan ahead -- the first vintage of Goldeneye (1997) wasn't released until 2000. Goldeneye has always been about a style of Pinot Noir that Duckhorn correctly anticipated would be popular: big, ripe and bold. 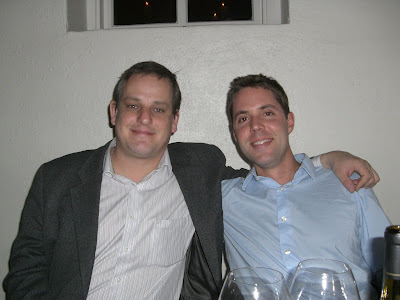 "Goldeneye is focused on an American aesthetic of Pinot Noir," says Goldeneye winemaker Zach Rasmuson (left). Starting with the 2001 vintage, Goldeneye added a second label, Migration, with wines at half the price of Goldeneye's. I don't know this to be true, but I always assumed Migration got the lesser-valued barrels because that's the way second labels work. However, in this case the lesser-valued barrels tended be the less big and ripe ones. From now on, Migration will get its own grapes and has its own winemaker, Neil Bernardi (right), an enthusiastic 29-year-old prodigy who has been assistant winemaker at Littorai as well as assistant winemaker at Goldeneye. Ladies, don't get excited about this hot young winemaker: he's married. It's a nice story, too. Bernardi, a Marin County native, was preparing to intern in New Zealand and his mother was terrified he would marry a Kiwi girl and never come home, so she and a friend tried to set him up on a date with a Sacramento graphic designer they knew was also planning to visit New Zealand as a backpacker. But neither Bernardi nor the woman (Kimberly) was all that interested, though Bernardi did see her photo. Several months later, Bernardi was in a hostel in New Zealand when he recognized her. Turns out they hit it off immediately and they ended up traveling around Asia for 6 months before returning to California, just as their mothers planned. Speaking of planning, I asked the winemakers why Duckhorn Wine Company would want to expand like this, and Rasmuson said, "Why let an economic downturn stop us? It's the best time to grow a brand." Bernardi will get good fruit to work with from famous vineyards including Marimar Torres and Heintz Ranch. Bernardi says the plan right now is not to make single vineyard wines like Goldeneye, which is probably sensible given the turgid market for $75 Pinots. Even $34 Pinots aren't an easy sell, but the Duckhorn umbrella has cachet. Migration has also released the company's first Chardonnay, Migration Russian River Valley Chardonnay 2008 ($30). It has impeccable fruit sourcing from Dutton Ranch, Pellegrini and Balletto. I like the length of it, and it delivers good lemon fruit with some toastiness and a full, not flabby mouthfeel. I don't know if the world needs another $30 Chardonnay, but I don't bet against Duckhorn. I had a chance to taste the Migration Anderson Valley Pinot Noir 2007 ($34) against $380 worth of Goldeneye (five wines) with dinner at Wexler's (the cornmeal-crusted skate stuffed with pulled pork is one of my favorite dishes in SF right now). My favorite Goldeneye wine was The Narrows Vineyard Anderson Valley Pinot Noir 2007 ($75) -- raspberry fruit, soft mouthfeel, turns savory on the midpalate with a hint of white pepper, velvety finish. To me, it was the most Pinot-like of the Goldeneye wines. Yet I liked the Migration Pinot just as well -- typically Anderson Valley fruit-driven wine, with nice cranberry and some savory soy on the finish. Turns out Goldeneye is thinking about giving The Narrows Vineyard fruit over to Migration, though what that means for the pricing, I don't know. In any case, it will be interesting to follow Migration from this point. Given Duckhorn's savvy track record, I can't help thinking he sees a balance backlash coming and has planned a more restrained Pinot brand to take advantage of it.